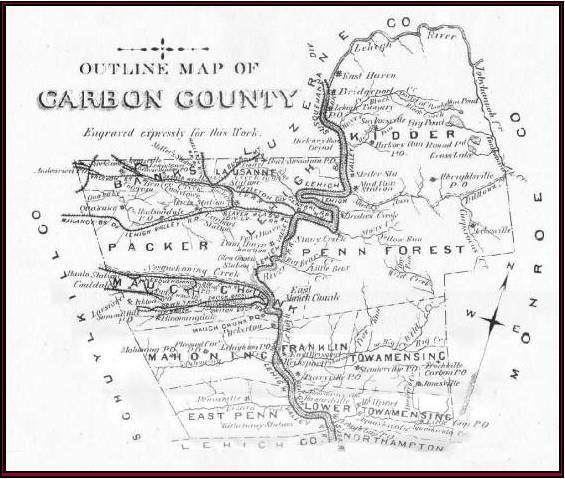 Carbon Co. Pa. is located in the eastern part of the state, about half way between the cities of Allentown and Wilkes Barre. It was one of the birthplaces of the industrial revolution in America; its rich deposits of anthracite coal sparked that revolution and are still fueling American industry today. Previously updated in the spring of 2013, I had big plans for adding things to the website at that time. Unfortunately, life has a way of interfering with the plans we make (to paraphrase John Lennon ). The site hasn’t been completely static since 2013, small additions, corrections and updates have been made, especially with the cemetery records. Hopefully, I’ll get more things online in the days, weeks and months to come. There were no incorporated boroughs in the county at that time. The townships of Kidder, Packer, Lower Towamensing and Lehigh were formed after the creation of the county. Besides the maps, the site includes the list of property owners and their addresses. Many cemeteries in Carbon County are fully recorded and online. Also, several partial listings of burials from other cemeteries are included. This site has been around for a while at different URLs. I don’t know who did all the work of transcribing this, but it is a wonderful resource for the early families of lower Carbon County. Some original biographies, covering people who haven’t been covered before. Mathews & Hungerford’s 1884 "History of the Counties of Lehigh and Carbon"
The histories of the boroughs and townships, plus biographies of prominent people and other chapters on Carbon County history are now completed and online. Some chapters and biographies on Lehigh County have also been added. Many thanks to those who have helped with the transcription! Marriage and obit extracts taken from the first 23 years of Mauch Chunk newspapers, starting with mid 1829 up to and including 1850. Following the flood, a fight to keep the new bridges free of tolls. Meetings held in Mauch Chunk and Towamensing Twps., a list of over 100 leading citizens. This 1845 “History of Northampton, Lehigh, Monroe, Carbon & Schuylkill Counties” has a long list of subscribers from the various counties. This is a list of those subscribers from Carbon County. 1836 Voter List for Mauch Chunk Twp. Below are links to other web sites concerned with Carbon County. Three important sites for census research, these are transcribed from the actual census pages. That means they are in text files, and download very fast (no waiting for images of the census page). They are also completely indexed! The US GenWeb Census Project for Carbon Co., Pa.
Planning genealogical or historical research in Carbon County? The Dimmick Library is the place to visit! Resources include a complete collection of Carbon Federal censuses (1790 to 1930), plus a nearly complete set of Mauch Chunk newspapers on microfilm from 1829 to the present and The Valley Gazette (a local monthly paper devoted to the area’s history). In addition to this microfilm collection, there are many books pertaining to Carbon Co. History, plus a cheerful and helpful staff of experts! Dalice Fadden’s site, one of the busiest places on the Internet. New info posted daily, includes biographies, obits, marriages and cemetery info. Here is a site with photos and a history of this historic borough. Information on this old time “suburb” of Mauch Chunk, this village was founded shortly afterward Mauch Chunk and was inhabited for close to 80 years. The No. 9 Mine & Museum Lansford, Pa. Here are three sites where you can post queries about Carbon County. A site full of local information and plenty of links. The society promotes Summit Hill’s important place as one of the cradles of the Industrial Revolution in America. Join now! Lee Mantz put this site together, which includes numerous photos Summit Hill and of the Switchback Railroad. Lee was an author and dedicated local historian, past president of the Summit Hill Historical Society. Tragically, he died in an accident while pursuing one of his passions – photography. America’s first significant railroad and later our first roller coaster ride, the Switchback Gravity Railroad ran in a figure-8 over 18 miles and was a major tourist attraction for over a century. Many early Chunkers were employed on the Switchback, used it for transportation, and rode it just for the sheer thrill of the ride. Visit our site for information on preserving and protecting this important part of American Heritage. Members needed! These sites provide up to date information on the town formerly known as Mauch Chunk. Check these sites for information on events, lodging, restaurants, local news and people, street maps and more! This web site was constructed using Microsoft software and checked with Internet Explorer.